After my cousins left, my time in Armenia quickly wrapped up. I planned to leave the country two days later, and between the goodbyes and the packing, those days flew by. From the second their cab pulled away, I was running. I said goodbye to the Birthright staff and had a final dinner with work friends before going back to my friend Zoe’s apartment to start pulling my life together. 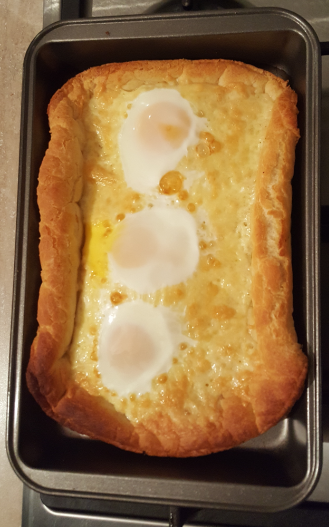 When I stayed at Olivia’s, we made our own khachapuri! Isn’t it beautiful? 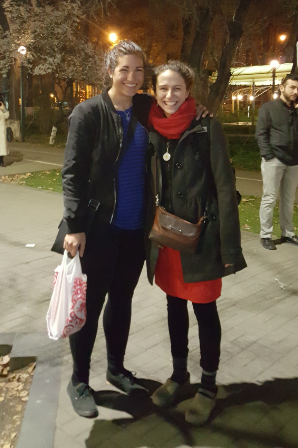 I want to take a second to shout out to Zoe and Olivia for taking me in during my days of homelessness in Yerevan. They’re the best. Not only because of that, but yeah, they’re the best. Zoe let me store my extra stuff at her place during the two weeks between my apartment move-out and my Armenia departure, and finally I couldn’t put off sorting through it any longer. Every time I move, I wonder the same thing… how on earth do I accumulate stuff so quickly?? I went to Armenia with a school backpack and a 55-liter backpack. I sent the school backpack home with my cousins, jam-packed with my Armenian notebooks and books and pairs of shoes (three! HOW??) and who even knows what else. That left me with one bag to hold the rest of my stuff, and the only options for each object were fit it or leave it. I have this packing anxiety problem where I look at the pile of things to be packed, look at the bag, get stressed out, and decide that maybe it would be better to just ignore them both. As you can imagine, that’s maybe not the best approach to take because no part of it leads to me being ready to leave. I fought through it, and I don’t know how, but when I was finished, everything essential was inside my bag. It must be laced with a little bit of magic. My last night in Armenia was spent with Zoe and Olivia. We went to church together and then out to dinner, and I had that feeling again. You know, the one where you feel like everything is right. Like perfect contentment. There are a lot of reasons why I think I was meant to stay in Armenia as long as I did, and those friends are two of the major ones. If I had left when I planned to, I never would have met them, and trust me, that would have been a terrible shame. God definitely did a little divine plotting to bring us together, and I can literally pinpoint His reasons in each relationship. It’s cool to feel like I have such a solid confirmation that I took the right path. The next morning, I took a cab to the marshrutka station to catch a marshrutka to Tbilisi, Georgia. Before I go home, I’m doing some travelling around because why not? I’ve been saying that I’m taking the long way home… the VERY long way. 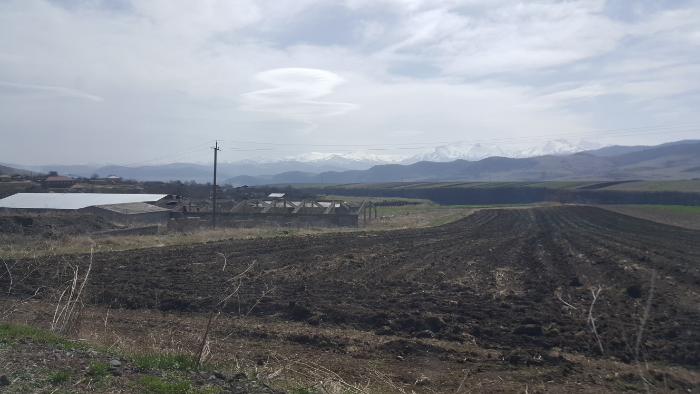 The plan for Georgia was to stay for about a week, spend some time recovering emotionally from leaving Armenia, and then move on to my next destination. This is random but I’ve been meaning to take this picture for so long. These gas stations are everywhere, and they always make me laugh. They’re called “Flash” when you see it written in English, but the way it’s written in Armenian letters is “F-L-E-SH”… flesh. Something about that just cracks me up. I wasn’t sure how I would feel about leaving Armenia. On one hand, I think I was ready. I was ready for a change of pace and some different scenery. On the other, everything was starting to fall into place for me there. I had some great friends, I could communicate fairly well, and I felt comfortable. Maybe that’s part of the reason it was time to move on… time to be uncomfortable again, time for the next challenge, time to stretch myself in a different way. I guess we’ll see what happens in this next chapter. To be honest, I don’t think it even registered that I was leaving for real this time. I had gone and come back so many times that my brain felt like this was a temporary trip again. Maybe I will go back to Armenia someday, but it’ll never be the same. I’m probably not going to have a life there again, and that makes me sad… but the fact that I’m sad makes me happy because that means I had a great experience. Leaving happy things behind is always sad. Taking a marshrutka out was a weird way to leave. When you fly, you’re in the country and the next second, you’re gone. In a marshrutka, the leaving is gradual. After we pulled away from the station, I still had four hours of Armenia ahead of me. 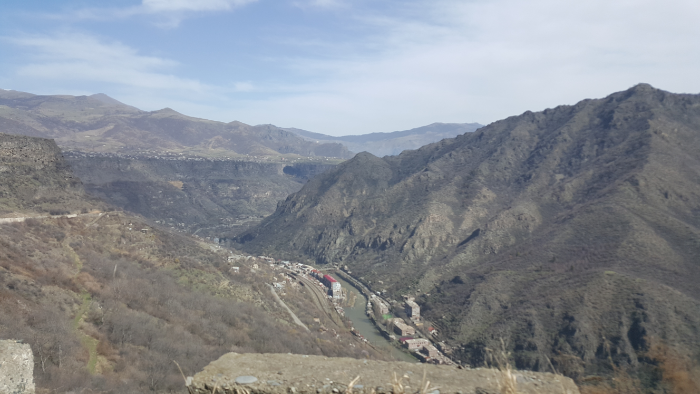 Here are some through-the-car-window shots from the drive to Tbilisi! I’m not going to say that I cried during the ride or anything. I’m also not going to say that I didn’t cry. 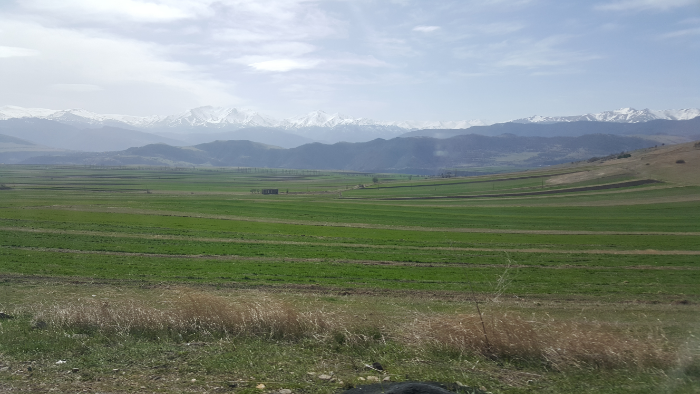 I will say that I spent the ride looking out the window, admiring the Armenian countryside and having some feelings about what was happening. You can’t really let yourself cry in marshrutka though. How embarrassing. And it’s not like in the US where everyone would pretend that you weren’t crying and ignore you. No, someone would absolutely ask what was wrong and that would make everything even worse. The ride to Tbilisi from Yerevan is five hours, and it felt like nothing. I would have been fine with sitting in that car for another five hours, but I think part of that is the fact that I always have a little anxiety about transitions. When you’re in the process of something, you know what to expect and you know you’re on some track (whether it’s the right or the wrong track is a different question that we’ll leave for another time). The transitions are scary because they’re unpredictable. And when you’re travelling, the transitions are also when you have to lug all of your stuff around, and that’s no fun either. Right at the end of the drive, you go through these awesome mountains. Like come on, Armenia, Are you TRYING to make me change my mind and stay? When we got to Tbilisi, the driver didn’t let us off near a metro station like I expected. Instead, we were at this bus station that’s totally not close to anything. Okay, keep your cool and use your brain, Lara (my mantra in every situation where my instincts say to panic, shut down, and cry in a ball on the ground). I realized that while the marshrutka driver was still there, I should ask him for help. I told him where I needed to go in Armenian, he asked this Georgian guy next to him in Russian, and the Georgian guy gave me two bus numbers and pointed me in the direction of the bus stop. And that was the last moment when my Armenian knowledge was of any use. Bummer, right? It’s always sad to realize that it doesn’t matter if you speak two or three or fifty languages as soon as you go to a country that doesn’t speak any of them. I made it to the bus stop no problem and checked out the arrival board to see when the next bus was coming. Thank goodness numbers are the same in practically every language because even if you can’t read the name of the bus route, you can at least see the numbers. After finding the right bus, the next step was figuring out how to pay. I got on, sat down (no small feat while also wrangling all of my stuff), and watched what other people did. Everyone got onto the bus, swiped their metro cards at this little terminal, and got a receipt. When I felt sure about the procedure, I left my stuff in the seats, went up to get my receipt while acting like I totally had things under control, and whacked my head on a bar as I walked back to my seat. So much for that. At the end of the bus line, I decided to just walk the rest of the way to the hostel because it was only six blocks… which is nothing until you’re wearing your life on your back and it’s a good 10 degrees C (20 degrees F) hotter than it was when you got dressed. So anyway, that’s how I started off my post-Armenia life: walking the streets of Tbilisi, wearing a huge backpack that got heavier with each step, and trying to pretend that I wasn’t sweating but definitely was. Off to a great start! Lara, wow – you’ve been taking us on the same roller-marshrutka you’re on. It’s hitting very close to home… wherever that is. Great blog, love these posts. Thanks for kindling my heart with memories of Hayastan. God bless you! Thanks 😊 glad I could help bring back good memories!